When the over the knee boots trend first started, my original thought was I’m 5’3 those boots will swallow my legs. This thought however didn’t stop me from pinning all the outfits with them. I decided to buy an affordable pair and give the trend a go. I found this pair on clearance over a year ago, and the brand no longer ships to the US. A similar pair that does ship here is linked, but I couldn’t find one with the under $100 price tag like my pair. Since I purchased mine, I have learned what works and doesn’t work for my petite frame. 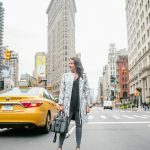 I wanted to share a little bit about what I learned on how to wear over the knee boots when you’re short. For starters, aim for the top of the boot to come no more than about 2-3 inches above your knee. Some item descriptions will list shaft height which is the length from bottom of your foot to the top of the boot. Since I do lots of online shopping, I will pull out a measuring tape before purchasing most boots to ensure the shaft will not be too high. For my outfit, I leave my tunics in the closet and opt for something that falls just below my waist. I want to have a good amount of jean showing to create that illusion that my legs are a little longer. I find fitted tops work best to keep proportions in check. If you do want an oversized top, I would make sure the length is still on the shorter side or even a high/low hemline. Over the knee boots look adorable with dresses in early Spring. For my petite friends, make sure a little skin shows between the boots and the bottom of the dress. I think 2-3 inches is a good amount, but be sure this doesn’t make the dress too short. You don’t want a light breeze to catch you off guard. Dresses with the high low hemline work perfect for us short girls to make sure we still get enough coverage in the back while still having a little skin show in the front. I chose a taupe color over black because I thought the neutral color choice would work better for creating an elongated look. Now that I have owned and styled this pair a bit, I feel a darker pair like black would still work with these same tips. If you have been thinking about giving this trend a go, keep your eyes on the sales. When sandals and wedges hit the stores soon, many OTK boots will start to get marked down. It will be a great time to buy without spending $200+ for a really nice pair of boots. Ya’ll have a good weekend and thanks for stopping by! You pull off otk boots perfectly. I actually think they tend to make your legs look longer! My friend Isabella is even shorter than you (4’11” in American measurements) and she is very fond of high heeled boots, she’s basically tiptoeing in them. She also likes to contrast them with the trousers. 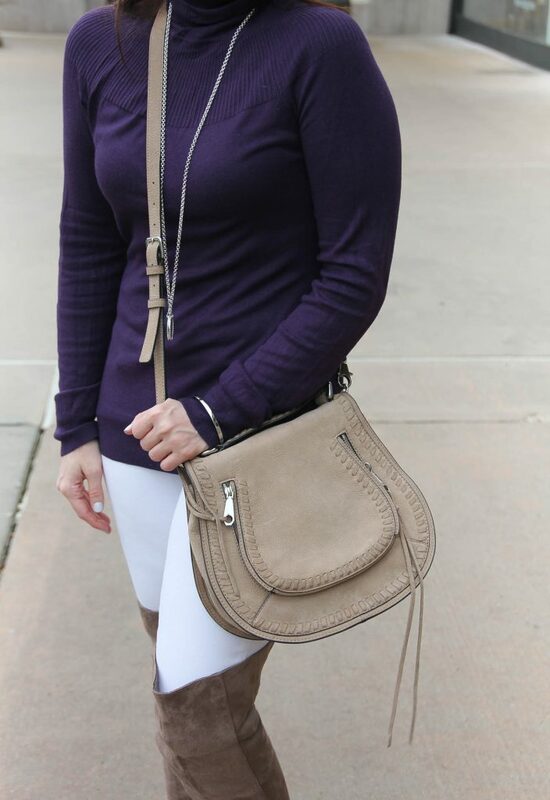 These taupe OTK boots look fantastic on you, and I love the bag too! i’m 5’3″ as well and have struggled with this. i love how the lighter boots work with dresses and white jeans, but i definitely gravitate towards the darker colors. they are so much easier to wear for me (typically with black or dark leggings/ pants). As a fellow shortie, I really enjoyed the tips. Love the colors you are wearing here and how well they work together! thanks for these tips 🙂 I really love that purple sweater with the boots! super cute! Thanks for this! I too am 5’3″ and really want OTK boots, but I have super short legs! Great tips, going to try these out. Very cute outfit. 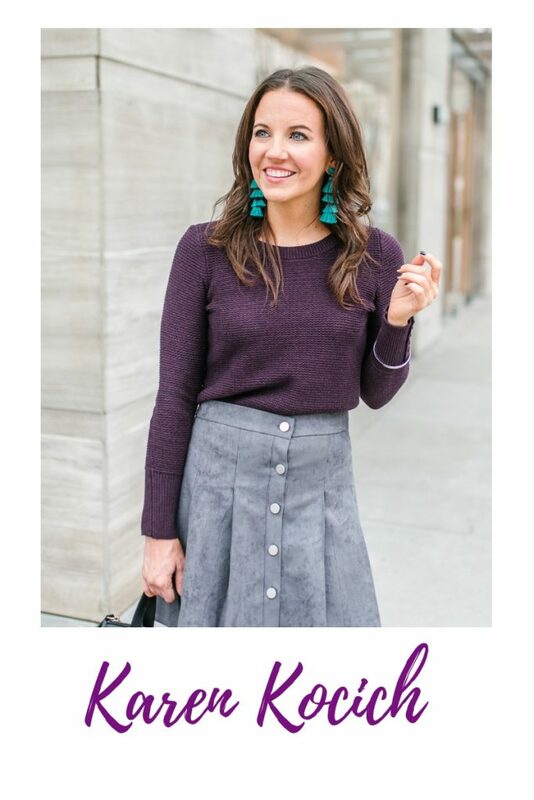 Thanks for linking up with us on The Blended Blog! I like your boots and outfit a lot. I just love OTK so great choice. You look fabulous in those boots. And the white pants look stunning.